I don’t like either of these options for our product review pages. I have an idea for a new product review page that I think will be much more appealing to the end user. So if you go to this website here, [login to view URL] , you can see they have top 5 products at the bottom of their page. 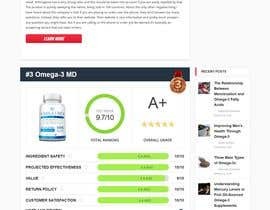 I want our review page to be the same sort of layout and look and feeling as the way they have their reviews, but on a separate page. So we will have a page which has 2 paragraphs which says bottom line, and have the same layout as them, but it won’t be 5 On one page, one of those. Reviews will be its own page, and it will match out website look and layout. I did a very basic photoshop job to explain exactly what I mean. I am very horrible at photoshop and this is just to further explain the concept. So the winner of this contest, will look at the reviews on smarter-reviews website, and apply this same sort of look and feel and create a product review page for us, which features the same layout they have for their reviews, but on a single page, matching the style of our website. Whoever can do the best job of this, will win the prize. Contest is guaranteed. That means someone MUST be awarded. Thanks for entering, Anyways I am always looking for talented designers as I am starting a marketing agency soon and will be hiring a lot of graphic designers :) If you know me, I throw a lot of contests here, good luck! Use your creativity! Make the product review page look awesome! High quality user experience is key! Well, I don't see many improvements over the design you already had. Sad to have worked on many entries, responding to every detail remarked and trying to take the design to a new place, and not even receiving feedback on the final entry for more than a month. Goodbye. Hello sir, hope you are doing well. May I ask if the prize will be distributed to all the freelancers or will a winner be selected for the contest? Hello sir, haven't heard from you for a long time. Hope you are doing well. If you don't mind please do leave a feedback on the new entries when you are free. These feedback are really valuable to us as they help us graphics designers improve and also provide the best possible design to contest holders. Thank you. Hello, I'm working ... But can you tell me your opinion about the offer in #163 ?!! Did you have the change to rate entry over #107? Hey, please have a look over my latest entries, thanks! Hi! I've updated my entry the other day. Your feedback will be really appreciated (it's #94). Thank you! hey! new entry with the asked updates. Please check #134. Thanks! Hi. I will work on it. Please check Entry #81 and feedback please. Thanks. Hello, could you please give me feedback about entry #58, if you did not like rounded corners, I can work on a new design. Thanks. I had one of my personal designers who is not in the contest do his own version of the page, and I think its the best one yet. If you want to edit his page that is great. https://imgur.com/a/1V0v21p . I think his design is the highest quality one so far, if you want to win the contest then you can somehow improve his design in any way because I think his design is the nicest of the contest. So if someone can improve his design somehow they will win, but if nobody can improve his design then I will just split prize amongst people who entered I suppose. The person who did this design is not on the contest. ok I will create some new draft for you according to your guide line and post asap hope you will like that one request i posted my edit designs #55 and #57 hope you checked them also. Thanks and wait for my new entry.